Home > Strategic Task Force on Alcohol: second report. Strategic Task Force on Alcohol. 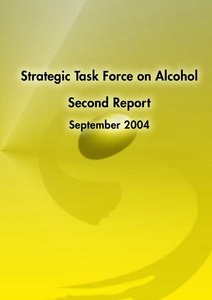 (2004) Strategic Task Force on Alcohol: second report. Dublin: Health Promotion Unit, Department of Health and Children. The Minister for Health and Children established the Strategic Task Force on Alcohol (STFA) in January 2002, as recommended in the first report of the Commission on Liquor Licensing. The brief of the Strategic Task Force on Alcohol is, inter alia, to recommend specific, evidence based, measures to Government to prevent and reduce alcohol related harm in Ireland.